If you are a small or medium-sized business owner in Houston, you might be wondering how to attract more traffic to your site. There are a few things to consider: your site’s mobile-friendliness, professional web design, responsive design for better site display, and responsive design for better page ranking. Here’s an overview on how to find good web development and why responsive design is important for your site. Laying the foundation for your business online is critical. If you were building a brick and mortar presence for your business, you would likely hire someone who is experienced in the territory and could create a solid, polished design. Professional web designers know how to truly put together a polished and detailed website. They know how to direct your audience to that website and they know how to maintain it in such a way that your company is presented in the best way possible. You will build trust through a very detailed, professional online presence and thus increase your sales and leads. In establishing a presence on the web, you’re going to face stiff competition from other vendors who are also using the web to gain an advantage. If their sites are better than yours, they’re going to get more traffic and sales that you may be missing out on. You may have heard the term “responsive design” being thrown around in the marketing world. Responsive web design is not just a buzzword, a fad, or a trend. Responsive design is a special means of coding a website in a way that it will work on any device such as tablets, mobile devices, laptops, different resolutions, and so on. Responsive design uses fluid grids and images as well as CSS3 media queries. 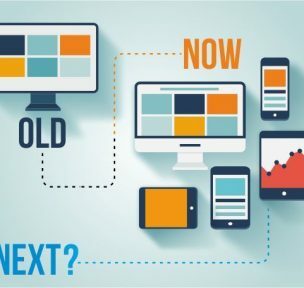 Responsive design is an iterative process that continues over time to help optimize a user’s experience. Designers and developers need to be able to make a business’ site usable on any device in terms of performance and functionality as well as appearance. Any reputable online business needs responsive design to save money, save time, and help your SEO. The customer or business owner will only need to pay for one website to be developed, not three or four different sites for mobile and tablet and laptop. And since only one site is being developed, your monthly web costs will go down a lot. It will save time since your planning will allow for new content to reach all of your customers at one time. All you need to do is implement responsive code design programming which will allow for greater efficiency across one set of code that migrates across devices. And finally, SEO is much more effective through responsive design. You only need one URL for desktop, mobile, and the varying bots that crawl these for search purposes. This means that your sites are completely uniform, making it easier for Google to link up and crawl your site and therefore, you can rank higher in the search engines. How Does Responsive Web Design Help with Google Page Ranking? Google absolutely loves responsive web design. Why? Because responsive web design helps to combat high bounce rates or the likelihood that someone will only stay on your site for a few seconds before leaving. Google believes that high bounce rates mean your site doesn’t offer good quality content to users and thus ranks your site lower in the search results. Responsive design presents each version of your content in a functional, attractive way. You won’t need to worry about compromises in the quality of how your content is presented across devices. All visitors see the same page, regardless of device. The increased performance due to responsive design is another factor that Google made clear in its latest Mobile Friendly update in April 2015. Responsive web design (RWD) helps with Google page rankings because of a better User Experience (UX). This means that it is easy to share content across different devices. If you see something on a site while using a PC and want to send it to a phone user, as long as the site has RWD, the content will show on their screen just like it does on your screen. RWD provides a modern experience that shares well across platforms. One last great perk of responsive web design: knocking down duplicate content. When Google rolled out their Panda update in 2011, they killed the problem of duplicate content once and for all. And thus, responsive design completely avoids this issue. All design is on one website, not two or three or four. All of the above reasons contribute to one simple message: responsive, affordable web design produced by a competent professional is critical to attracting new customers. Your site will look better, function better, and be visible to a greater audience because Google will automatically rank it higher in the search engines. Tuispace.com can help with your responsive web design needs at extremely competitive rates. Visit https://tuispace.com/websites/ – Custom web development to learn more. Or, if you’re on a budget, we’ll take a theme and produce the exact results you need for your business. Check out https://tuispace.com/managed-it-services/managed-wordpress-hosting/ to learn more!